Welcome to our new and improved web site. Please visit often to keep up with our latest news and wines. The Four Walls Wine Company was started as a club by Barry Phillips in 1969 which expanded and eventually became a commercial enterprise affiliated to the White Horse at Chilgrove. The wine list of the White Horse won every vinous award in the world over the 30 years that Barry was landlord. When Barry retired from the restaurant business in 1999 he continued with this first love - wine. The Four Walls Wine Company offers not only stock accumulated during the early years at the White Horse but also wines purchased from great vineyards and vintages in more recent years. 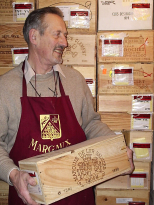 All wines are immediately available for worldwide delivery, unless otherwise stated.